Se proporcionan bicicletas y cascos de alta calidad. Daniel exceeded all expectations! He was super friendly and knowledgeable and he showed us so many wonderful places about Mazatlan on the bike. It was the highlight of our entire 10 day cruise! Thank you Daniel. This was a great tour. We were very late getting off our boat and they waited for us and were so nice about it. They went at our pace, never felt rushed or bored. Listening to the history and legends of Mazatlan between our biking along the ocean was so much fun. I think our tour guides knew just about everyone along our trip. I highly recommend this tour to anyone, even if you are out of shape for biking. Our favorite tour of our trip. This was the best tour I have ever taken. My entire family felt the same way. Very knowledgeable and enthusiastic tour guide. Easy ride, excellent recommendations from the guide. We really enjoyed this tour - Daniel was a great guide. We a group of four people travelling together booked this tour in conjunction with a cruise we recently took. It sounded like a great way to see Mazatlan since we've never been there before. Daniel met us as we got off the ship and drove us to a place near the beach where we picked up our bikes. We rode at a leisurely pace along the beach Malecon and saw the cliff-divers. We went through town and visited the cathedral and a marketplace. Daniel provided us with some interesting historical facts as we went along. We never felt hurried or rushed, and all of us really enjoyed the ride. After we were done, Daniel recommended a great restaurant for lunch the Presidio which topped off the day. 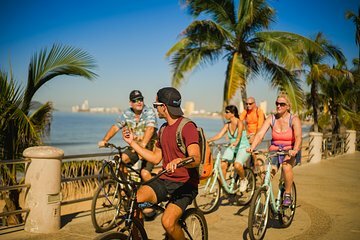 We loved exploring Mazatlan on bikes, and really got a feel for the city through the helpful commentary of our great guide, Daniel. We started our trip to Mazatlan with a bicycle tour led by Daniel. He was a tremendous guide!!! He was very knowledgeable about both the history and the cites of the city. He was considerate of the various fitness levels of each of the members of the group and was constantly checking on our welfare to insure that we were all enjoying the ride. I highly recommend this tour. Daniel was a great guide. He was very proud of and knowledgeable on all things Mazatlan. He was very accommodating and safety oriented. The quality of the cruiser bikes however was subpar. Loose head sets some rust.